No sensible diet plan includes unlimited eggs and bacon, but this favorite breakfast could be a part of a healthy weight-reduction program. Low-carbohydrate diets reduce refined high-calorie foods but keep reasonable amounts of fats and proteins on the plate. Low-carb diets efficiently drop pounds over the short term, but some doubts remain about their effects on health over the long haul. Low-carb diets don't focus primarily on eggs and bacon. The Atkins Plan adds controlled amounts of eggs and bacon to meals but also relies on other healthful foods such as fish, lean meat and soy protein. Other practical weight-reduction plans reduce the refined carbohydrates in the diet, cutting out foods like potatoes and white bread which cause a surge in insulin levels followed by increased hunger. Low-carb diets control total calorie intake as well and don't allow dieters to eat all the eggs and bacon they want. Dieters who follow low-carbohydrate high-protein diets faithfully for six months lose more weight than those who adhere to low-fat high-protein diet plans. Levels of healthy cholesterol in the low-carb dieters also improve compared to those on low-fat diets. In a study conducted by Duke University, participants dropped 26 lbs on average with the low-carb diet, but only 14 lbs. by following the low-fat plan. Low-fat dieters saw a greater reduction in total cholesterol, but low-carb dieters cut harmful triglycerides by 50 percent and raised healthy cholesterol levels by five points. Low-fat diets may cause constipation. Reducing carbohydrates also creates other nutritional imbalances. Carbohydrate sources with a low Glycemic Load or GL provide essential nutrients without the weight gain problems of high-GL foods. Including vitamins and fiber supplements as well as beans and fruit prevents many nutritional issues. Whole grains provide essential nourishment in the form of complex carbohydrates, without the surge in appetite. Eggs and bacon enhance another of the positive aspects of the low-carb diet by making the menu more attractive. Dieters find the low-carb program easier to follow than less flavorful low-fat plans. The type of fat in the plan affects a dieter's success in lowering cholesterol levels. Low-carb plans which include larger amounts of saturated fats -- found in eggs, bacon and red meat -- don't qualify as heart-healthy. Replacing saturated fats with healthy fats shifts the balance toward healthy cholesterol in the blood. Good sources include vegetable oils, oily fish like sardines and salmon, and nuts. Eggs and bacon with every meal quickly pushes an individual over the recommended daily limit of saturated fat. One large egg holds 71 percent of the daily limit set by the American Heart Association. 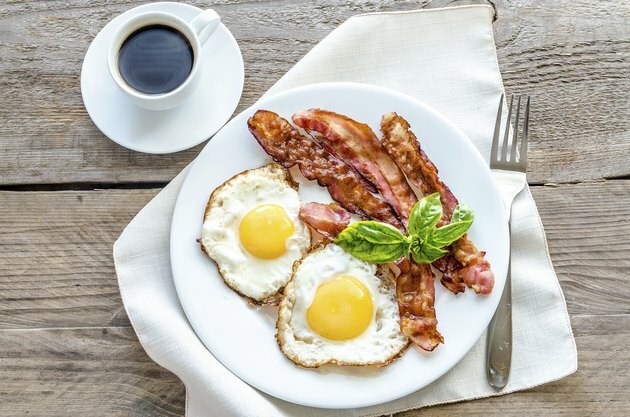 The Atkins diet uses bacon and eggs as an introduction to the regimen, replacing this dish with healthier protein sources as the diet progresses. Estimates of safe egg consumption amounts vary. In 2008 Dr. Luc Djousse of Harvard Medical School published the results of a study which found that six eggs per week had no effect on mortality rates. Dr. Will Yancy of Duke University Medical Center considers a six-month low-carb diet safe. Over longer periods the low-carb diet could increase harmful cholesterol, cause bone loss, or increase the risk of kidney stones.